High Fibre salad recipes, Fibre Rich Indian salad recipes. High fibre salad recipes, Fibre Rich Indian salad recipes. Salads is the first foods that strikes our mind when we think of including vegetables in our diet. However most of us find them to be too boring. But these are essentially a healthy munch on which keep you full for long hours. We have split the salads into high fiber low calorie salads and high fiber high calorie healthy salads. Here we give you some low calorie options. Garlicky Cabbage and Spinach Salad, Zucchini Bell Pepper and Sprouted Moong Salad and Minty Apple Salad are a few recipes which offer a wide range of flavours – sure to please you every day. Of course these types of salads need to form a part of our daily diet, but minus the fat which we add by way of creamy dressings and cheese often. Learn to make a variety of dressing like we have made Parsley honey mustard dressing in Muskmelon, Pear and Apple Salad, Melon Dressing in Apple and Lettuce Salad with Melon Dressing and Low Calorie Thousand Island Dressing in Fruit and Vegetable Salad with Low Calorie Thousand Island Dressing. These simple, tasty and easy to make salads if incorporated in our daily diets are sure to keep your gut healthy, aid in weight loss and boost your metabolism as well. Here are some high fibre salads you can take to work or have as a complete meal. They use healthy fat which is good for you like feta, olive oil, avocados etc. Try the rocket leaves, red pumpkin and zuchinni salad or kale masoor antioxidant salad. For sprout lovers we have mixed sprouts beetroot salad which makes a perfect healthy lunch option or one dish meal. For cheese lovers go for orange spinach and feta salad which gives you tanginess, juiciness and crunch. 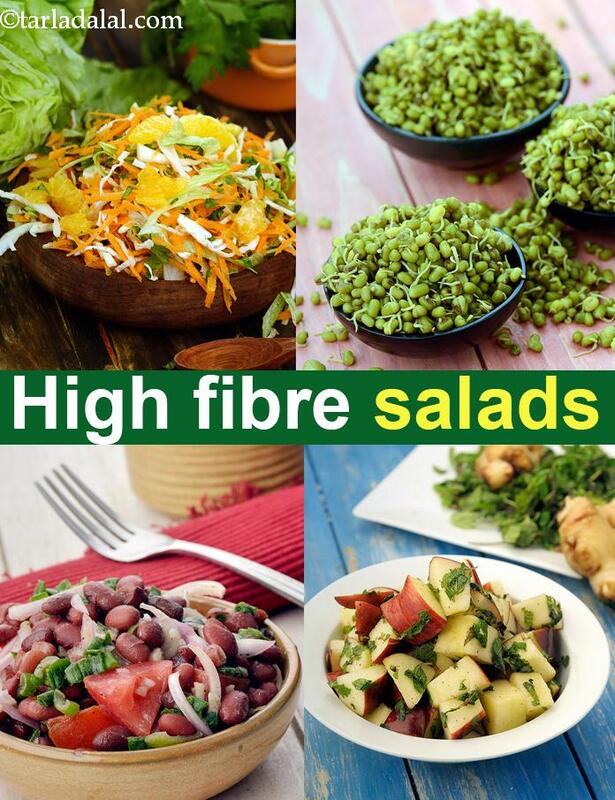 Enjoy our High Fibre salad recipes, Fibre Rich Indian salad recipes and other fibre recipes below.